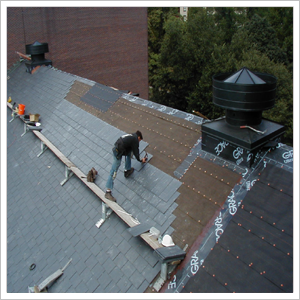 Our roofing division was founded on a platform consisting of: service, quality, and personal integrity. Our founder believes that these three characteristics must be in place in order for any company to succeed. All employees are carefully selected to ensure that service, quality, and personal integrity come shining through on every job we do. Founded over 20 years ago, we are proud of what we�ve accomplished so far and look forward to continuing our mission for decades to come. In addition to providing Woodlands with expert roofing services, we are genuinely nice. From your first call to request a free roofing estimate to every encounter you have with our roofing crew, we�re confident that you�ll be impressed by the friendly, professional employees that make up our team. When you request a roofing quote from us, we won�t simply guess. We�ll come out, measure the home, discuss your roofing needs, discuss roofing materials, and prepare a free, written estimate. We will also provide you with crucial paperwork documenting our worker�s compensation and general liability insurance policies. Many Woodlands roofing customers shop around before making a decision, and we both understand and expect this. Refer to our detailed estimate and remember to compare apples to apples as you compare bids. If you�d like a list of local references to call during this process, we are happy to oblige.